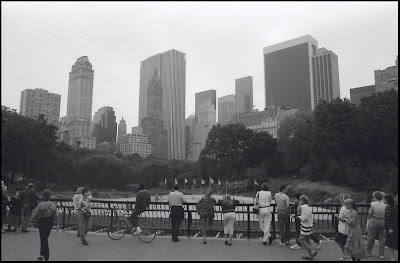 August of 1988 finds us looking over Wollman Rink in Central Park. This was a couple of years after Donald Trump did the only thing that I ever admired him for: He took over the rebuilding of the 1950's-era ice-skating rink from the city. New York had already spent several of the prior years attempting this, in fact, they took since the end of the 1970's to tear down and try to rebuild the place. Trump was looking at the project, and in essence said, 'It's a goddammed ice-skating rink. Give it to me, I'll open it in six months.' That was the summer of 1986. That winter, Wollman Rink was open for skaters, and has been every season since. 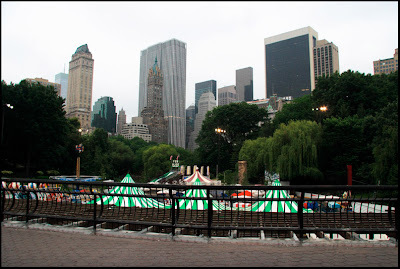 Many of you will remember Wollman Rink for the Schaeffer Concert series that ran here for some twelve summers beginning in 1967. I was here for a few shows in 1979, the last year before the shows moved to the pier. I know I saw Eddie Money here, as well as the Kinks. This place was better than the pier, though, because if you didn't have a ticket you could just sit in the park and listen; there were even some rock outcroppings that you could sit on and look down into the rink as well. During the summers these days a carnival called Victorian Gardens operates, which explains all the striped tents. In the past, summers saw a miniature golf course and roller-skating rink. The skyline only shows minor changes: trees have grown, of course, and only a single new building has gone up a few blocks beyond and to the left of the tower at 800 Fifth Avenue.